Get on our email list to receive periodic updates of trails new, events and progress! Sign up now. Experience Level: Moderate. Contains a 1649 foot elevation gain over 3+ miles. Some very steep areas. Parking Area: Parking lot outside of park gate, Konocti Rd, Kelseyville, CA. A steady 1,649-ft. climb along a winding dirt road through open brush, past mature orchards, under towering oak forests to reveal stunning views at the top of Mount Konocti. During winter, while weather might be fine at lake level, winter storms can bring snow and ice. Though the trail contains long stretches of shade, in the summer, mornings are best due to intense midday sun. There are no water sources on the mountain, so fill your bottles ahead. Best views are from the Cal Fire Tower, only open to the public during docent tours. From downtown Kelseyville, turn onto Konocti Road and drive past the park entrance (1) for 3 miles. From the parking lots (2 & 3) , head up the road. Shortly you will come to a locked gate (4); skirt this to begin your hike. A flat dirt road takes you toward the trail head at a walnut orchard. Turn onto the trail (5), and soon you will notice a peak directly in view - Clark Peak (6), elevation 2,850 ft.
Scramble up a steep hill which reconnects to the dirt road (7). Continue for 1.2 miles. Occasional clearings in the brush offer peek-a-boo views of Clear Lake and the ridge line. At 1.6 miles, you come to a fork in the road (8) - the left heads off to Buckingham Peak and the cell towers. Take the right hand road on your trek to Wright Peak. You are now at 3,489 ft. elevation. Soon you will enter a deep forest filled with towering canyon oaks, some believed to be more than 500 years old. Nicknamed ‘maul oaks’ for their use as axe handles, one can marvel at how they thrive in an area seemingly devoid of water. Relax, sit in the shade, and listen to birds singing. In the middle of the oak forest, turn right down a shady dirt road (9). Ahead you will see remains of the first homesteader’s cabin, built in 1903 by pioneering woman Mary Downen (10) - (see side bar below for more info). Areas have been cordoned off to protect potential archaeological sites - please respect them. The cabin sits on the edge of a bucolic orchard planted by Mary’s son-in-law, Euvelle Howard. Head down the path through the orchard. A short side-trip (11) will take you to one of the oldest and largest Canyon live oaks (also called ‘maul oaks’ as their hard, dense wood was formerly used for wood-splitting mauls). Continue into the walnut orchard (12) for glimpses of Lakeport and the west shoreline of Clear Lake. Each day at 2 p.m., Mary Downen would flash a mirror, signaling her health to her family in Lakeport. Retrace your steps to the cabin. The grave of Mary’s son-in-law, Euvelle Howard, rests 500 feet away (13), his epitaph chiseled onto a huge boulder. Back at the main road, turn right - you are at 3,775 ft. elevation. Continue the upward climb another 0.5 miles until you reach a fork (14). A half-mile detour will take you to the top of Howard Peak (15), elevation 4,286 ft. Beautiful views of Big Valley, south toward Cobb Mountain, Lakeport, and the North shoreline abound, but the last 200 feet are only for the surefooted - the road is steep and slippery. exist within, only small caves have been found. Head up the hill to the Cal Fire Tower. You’ve reached the summit at Wright Peak 4,299 feet, the highest point on Mount Konocti (16). Breathtaking views of Clear Lake and the surrounding mountains can be seen from each side of the peak. To the south, Napa’s Mount Saint Helena stands just 43 feet taller. To the west, the Mayacamas, north to Pinnacle Rock and the remote Snow Mountain region. On a clear day, there are views east to the Sutter Buttes and as far as Mount Lassen. If a docent is on-site, you can climb the tower for stunning 360 degree views. Until recently the panorama was utilized by fire lookout crews since the tower’s construction in 1964. Relax and take in the scenery, knowing that the 3-mile return trip is all downhill. Retrace your steps and you will arrive back at the parking lot. 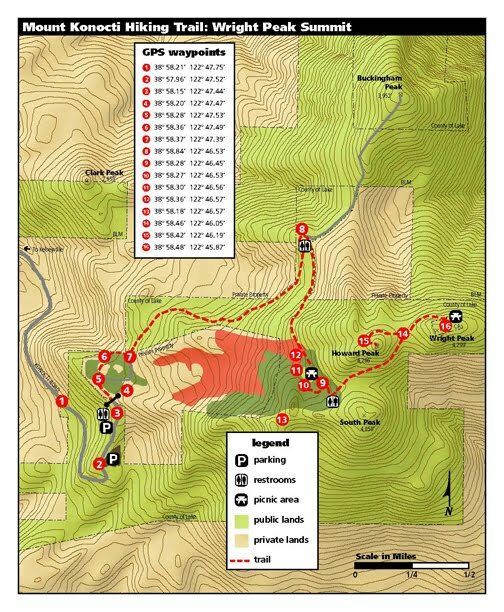 For an additional route, take the left fork (8) for a 4.7-mile round trip excursion to Buckingham Peak (elev. 3,952 ft.) and the cell towers. In the spring of 1903, Mary Downen of Lakeport began a quest for a quiet and remote place to live. Fiercely independent, she took a horseback ride to the top of Mount Konocti with her son-in-law, Euvelle Howard, and fell in love with the unsurpassed views, majestic oaks, and good soil. The following morning, Mary staked her claim, paying $600 to have the land surveyed. A small cabin was built and she began homesteading on the mountain. With no streams or springs nearby, water was initially hauled up the mountain, and then rain water was collected in barrels until cisterns were dug. Each sunny day at 2 p.m., Mary would communicate with her daughter and family in Lakeport by flashing a mirror. Euvelle Howard ultimately moved to Mount Konocti and planted the orchards at the edge of the cabin. Howard Peak is named after his family. Upon his death in 1942, his life-long request was honored, and his remains were buried about 200 yards up the hill, where the words “Euvelle Howard 1867-1942” are chiseled into a large boulder.